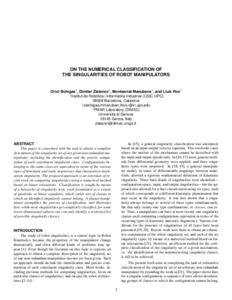 This paper is concerned with the task to obtain a complete description of the singularity set of any given non-redundant manipulator, including the identification and the precise computation of each constituent singularity class. Configurations belonging to the same class are equivalent in terms of the various types of kinematic and static degeneracy that characterize mechanism singularity. The proposed approach is an extension of recent work on computing singularities using a numerical method based on linear relaxations. Classification is sought by means of a hierarchy of singularity tests, each formulated as a system of quadratic or linear equations, which yields sets of classes to which an identified singularity cannot belong. A planar manipulator exemplifies the process of classification, and illustrates how, while most singularities get completely classified, for some lower-dimensional subsets one can only identify a restricted list of possible singularity classes. Bohigas, O. [et al.]. On the numerical classification of the singularities of robot manipulators. A: ASME International Design Engineering Technical Conferences. "Proceedings of the 2012 ASME International Design Engineering Technical Conference". Chicago: 2013, p. 1287-1296.